Could a simple vitamin pill help prevent skin cancer? Every year, more new cases of skin cancer are diagnosed than the number of new cases of breast, colon, prostate and lung cancer combined. New research may have found a safe, inexpensive way to lower the risk of people who are at a higher risk of developing the most common types of skin cancer—basal cell carcinoma and squamous cell carcinoma—which effect more than 2 million people in the U.S. annually. At the May 2015 meeting of the American Society of Clinical Oncology, researchers from Australia presented the results of a phase 3 double-blind randomized controlled study that showed that daily use of a form of vitamin B3 known as nicotinamide for 12 months reduced the incidence of non-melanoma skin cancers 23 percent in people at high risk for these cancers. In this case, high risk was defined as people who had previously been diagnosed with a form of non-melanoma skin cancer including, basal cell and squamous cell carcinomas or a pre-cancerous condition known as actinic keratosis. Phase 1 and 2 studies had found that nicotinamide enhanced DNA repair after exposure to UV light and reduced the number of non-melanoma skin cancers in both mice and humans. In the phase 3 trial, 400 high-risk patients who had been treated for a minimum of two non-melanoma skin cancers in the prior five years were divided into a treatment group, where they took a pill that contained 500 mg of nicotinamide twice a day, and a placebo group. The average age of the study participants was 65 and two-thirds of them were male. Many were living with a range of chronic health problems, including high blood pressure, heart disease, arthritis and lung disease. The researchers found that a reduction in skin cancers and precancerous actinic keratosis could be noted at the first three-month visit to check for the development of new cancers. Over the course of the study, patients in the treatment group had an average of 1.77 new cancers compared to 2.42 new cancers in the control group. The researchers also noted that nicotinamide did not cause the side effects that commonly occur with high doses of other forms of vitamin B3 like niacin. Higher doses of niacin can cause headaches, flushing and low blood pressure. Once patients stopped taking the nicotinamide, however, its preventive benefits quickly waned. The results of this study should not be read as suggesting that everyone can lower their risk of non-melanoma skin cancer by taking this form of vitamin B3. The researchers stressed that this preventive approach is only for patients who are at high risk for these cancers and that no one should start taking this supplement without first consulting with their physician. 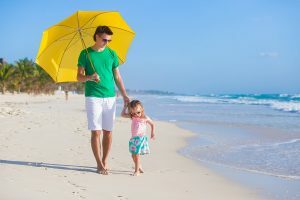 In addition, they strongly urged the consistent use of sunblock, sun protective clothing, avoiding the sun when its rays are strongest, and regular skin cancer checks with a physician for everyone, whether they are at an increased risk for skin cancer or not. If you have been diagnosed with skin cancer or want help developing a strategy to lower your risk, a health advisor can be an asset. An advisor can connect you with experienced specialists in dermatology and oncology and can provide evidence-based information about available treatment options to help you decide which approach to follow.